I covered Part 1 of the Oracle Ravello Blogger Day in my previous post. This post is all about the second part of the day which was devoted what we were originally invited for: Ravello. To answer that question and start us off, Navin Thadani, VP, Product Development, Oracle Ravello Cloud Service came to the stage. He explained that after the acquisition by Oracle, Ravello had to go through some transformation that was necessary for it to operate within a large enterprise. Not only that, they were also working hard on new features, integration with Oracle Cloud and geographic presence etc. As more was to come later about road map and the technology enhancements, for the benefit of people who may not know, he gave a high-level overview of Ravello. If you don’t already know, “Ravello is an overlay cloud service which takes any VMware based multi-VM application and run it in the cloud without making any changes“. That includes no changes to workload, storage or even its networking. This is immensely useful to organisations that want to replicate their environment elsewhere, for Development/QA, Training, Upgrades or even security testing etc. 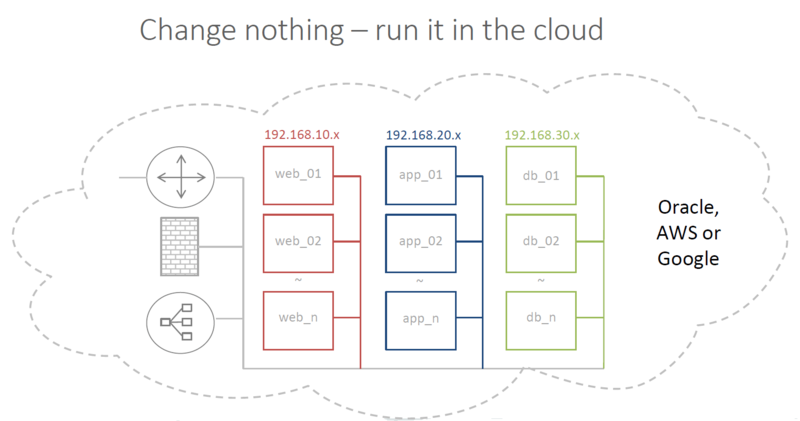 Ravello enables that by transparently replicating entire sets of machines in AWS, Google and now Oracle cloud, without any complications that come with conversion changes. The magic is in the HVX Hypervisor engine that creates a software-layer which abstracts the differences between the on-premises and the target cloud infrastructure. HVX works by running on already virtualised environments by using Binary-Translation with Direct-Execution. It goes without saying that there are many infrastructure differences to consider when running a virtual machine of any flavour on an alien cloud environment e.g. virtualisation hardware (BIOS/Chipset/NICs/Controllers), networking and storage infrastructure. Working out the different permutations and creating a software layer to abstract those differences is the key and Ravello has done exactly that. The result, of course, is being able to run the virtual machines unmodified on any of the cloud environments mentioned above. As I mentioned in Part 1, getting acquired by Oracle has enabled Ravello to explore other avenues that were not possible before. For example, AWS or Google didn’t allow access to hardware virtualisation extensions. That meant currently, Ravello is limited to Software-based nested virtualisation, which hampers performance and therefore, makes the resulting environments suitable only for Dev/Test like environments. With Oracle Cloud at its disposal, Hardware-assisted virtualisation becomes available, which increases performance. That in turn, means that production workloads can also be run under Ravello on Oracle’s Bare Metal cloud offering, which is coming soon. Ravello estimates that 95% of customer workloads are not performance critical and they can be run on top of Ravello on the Bare Metal cloud as-is i.e. without any modification. The rest can run on another platform that Ravello is also working on that’s coming soon: HVX on bare metal. The hypervisor running on sufficiently sized bare metal host will give enough performance to satisfy the demands of any workload. What else is on the road map? The answer is: A lot! A “Global Routing Network” is in the works that will provide Public IP connectivity at each geography, with less hops/latency. In addition to that, deployment across 30 regions is planned and about two-thirds of which is already live. We’ve already talked about hardware-assisted virtualisation/Bare Metal HVX, which will be coming soon too. For vertical scaling, the virtual machines will soon go up to 4x bigger i.e. 32 vCPUs with 200 GB RAM. Also, desired features like Host anti-affinity and Guest restart will be introduced. VMs can already be locked down to run in specific cloud regions but soon VM image storage restrictions will also be enabled. That will help with Data Sovereignty requirements as even images should not be traversing other regions when restricted as they also contain sensitive information. Also, while the underlying cloud environments are already SOC 1 & 2 compliant, work is being done to get Ravello compliant too. Another feature in development is Network Editing 2.0. In the current version, network connectivity is auto-generated by reading the metadata from the machine and there are no editing capabilities. Sure, one can add/remove NICs and do basic IP filtering etc. but that’s about it. New capabilities, when released, will allow to express custom network topology, increase visibility and allow network automation. Also, there are enhancements in auto-generation where there is logic to workout where an interface needs to go (based on the configuration) and it automatically is attached to the right network location. In addition, the network topology can be extended further by creating new switches, ports, subnets and VLANs whenever required. Current networking in Ravello is lacking a little so I am glad that these changes are just on the horizon now and I can’t wait for them to be released. I am really glad not only because Ravello is alive and kicking but also because it’s being developed for production scenarios now. Being integrated with Oracle Cloud has given it the platform that it needed for performance and that’s good news for organisations that are already interested in this technology but want to go further with it in their migration to the cloud. As I said above, one of the biggest hurdles I see in organisations moving to the cloud are the complexities involved in the process, especially with legacy applications. Being able to just “Lift and Shift” those applications relives them from one major headache as legacy applications are sometimes very valuable too. While normally the approach is to move the “easy stuff” first, Ravello might just bring those legacy applications to the front of that queue! It was a long day with lots of information but went past surprisingly quick. I am sure that was because everyone enjoyed the informal way in which the discussions happened. There was a lot of technical discussion, interspersed with jokes and jibes, which kept everyone refreshed. I hope both parts were useful to you and gave an idea of not only what Oracle Cloud and Ravello are about but also how they’re integrating together to provide another cloud solution that might help transitioning to the cloud a little bit easier.